It’s a kind of scientific integrity, a principle of scientific thought that corresponds to a kind of utter honesty—a kind of leaning over backwards. For example, if you’re doing an experiment, you should report everything that you think might make it invalid—not only what you think is right about it: other causes that could possibly explain your results; and things you thought of that you’ve eliminated by some other experiment, and how they worked—to make sure the other fellow can tell they have been eliminated. Details that could throw doubt on your interpretation must be given, if you know them. You must do the best you can—if you know anything at all wrong, or possibly wrong—to explain it. If you make a theory, for example, and advertise it, or put it out, then you must also put down all the facts that disagree with it, as well as those that agree with it. There is also a more subtle problem. When you have put a lot of ideas together to make an elaborate theory, you want to make sure, when explaining what it fits, that those things it fits are not just the things that gave you the idea for the theory; but that the finished theory makes something else come out right, in addition. In summary, the idea is to try to give all of the information to help others to judge the value of your contribution; not just the information that leads to judgment in one particular direction or another. The problem is that this level of integrity is almost contrary to human nature. There is a great temptation to cheat, particularly when the rewards of fame and fortune are present. One of the most famous instances of scientific cheating is Piltdown Man. Piltdown Man was a hypothetical “missing link” between human and ape discovered by an amatuer paleontologist Charles Dawson at the Piltdown gravel quarry in 1912. Dawson stated that workmen at the quarry had discovered skull fragments which they had given to him. Dawson had been able to reconstruct the skull with these fragments and other pieces that he had found at Piltdown. 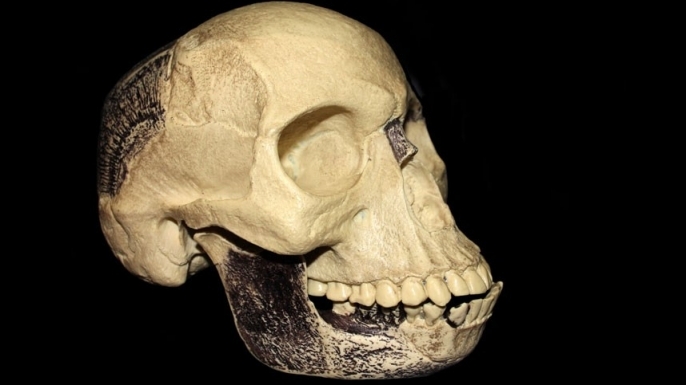 The resulting skull had a roughly human cranium, although only two thirds the size of a modern human brain, but an ape-like jaw with large canines. Clearly this was the remains of a creature caught midway in the transition between human and ape, the missing link of the chain of evolution. At first, there was some skepticism about Dawson’s find. The canines seemed too large for the jaw and the whole thing seemed to be just a little too neat a combination of human and ape. Then, Dawson found another skull about two miles away. It might be possible for a human skull and ape jaw to have somehow been put together once and fossilized . Surely that couldn’t happen twice. Piltdown Man was accepted as a legitimate ancestor to homo sapiens. At the time of Piltdown Man’s discovery, relatively little was known about the details of how humans evolved from their apelike ancestors. Over the years, more early human fossils were discovered and much more was learned about how humans became human. As the missing pieces were fitted together, it became increasingly obvious that Piltdown Man didn’t fit in. Paleontologists began to suspect that Piltdown Man was either an aberration, perhaps a mutation of some sort, of a hoax. In 1953, the question was definitely settled. Piltdown was shown to be a hoax. Piltdown Man was actually a rather crude forgery. The skull was that of a medieval man with a small head. The jaw was from an orangutan and the canines were the teeth of a chimpanzee. 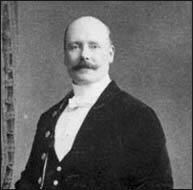 The only remaining question was whether Charles Dawson was the forger or whether he was merely an innocent dupe. Dawson was the obvious suspect, but there were others associated with the discovery of Piltdown Man, who might have been able to perpetrate such a hoax, notably Sir Arthur Conan Doyle of Sherlock Holmes fame, and the Jesuit priest and paleontologist Pierre Teilhard de Chardin. Recent research, however, has indicated that Charles Dawson was indeed the forger. He actually had something of a history of perpetrating such hoaxes and was well known for his skill at making unexpected archaeological finds, invariably later discovered to be forgeries. Why did it take so long to expose Piltdown Man? The forgery was not very sophisticated and the discoverer had a reputation for not being particularly honest. To be fair, a space of forty years between the discovery and the exposure is not an unreasonable amount of time considering how much was discovered about human development in that time. Still, one might have expected more skepticism to be shown, especially considering how important the find seemed to be at the time. It seems as if everyone involved in the research involving Piltdown Man showed a disregard for the sort of scientific integrity that Dr. Feynman was talking about. For years no one seemed to want to consider the increasing evidence that Piltdown Man wasn’t real. I think that was the problem. Piltdown Man was exactly what most paleontologists were expecting. At the time of his discovery, the general consensus was that human beings developed large brains first, while retaining a more apelike physiology such as a large jaw and lack of bipedalism. Only later, they believed did humans began to walk erect and to develop a flatter, more human face. It was also generally believed that human beings developed somewhere in Eurasia, Perhaps even in Germany, where Neanderthal Man had been discovered not long before, or in England. There was a certain amount of nationalistic pride in being the area where humanity began. It is not that surprising, then, that British paleontologists were the least likely to be skeptical about Piltdown Man. In any event, these assumptions that Piltdown Man seemed to confirm have proven to be wrong. Primitive humans, such as the Australopithecus (Lucy) began to walk erect on two feet long before developing larger brains, and the human race arose in Africa, almost the opposite of what was generally believed. I wonder how much these widely held but wrong assumptions held back the science of paleontology. I also wonder how many other Piltdown Mans there are out there that are holding back the progress of science. I don’t mean hoaxes or forgeries necessarily, though that is a greater problem is science than many realized, but ideas and theories that are held to be settled science but aren’t. I wonder how much that everyone “knows” to be true and so not worth questioning, are not true, and how long it will take before anyone thinks to question it. Have you ever wanted to get away from it all? Get away from civilization and all of its stresses and live a more natural life, perhaps on some remote island, untouched by modern society? Unfortunately, such places are rare and getting rare, as the march of technology makes the world ever smaller and more connected. It might seem that truly getting away from it all has become an impossible dream. What about a trip to the distant past? Way back before the rise of man. In fact, how about a trip all the way back to the age of the dinosaurs. Perhaps the Jurassic period, some 150 million years ago would be just the thing. Of course, you might object that the plants and animals might be very different then. How would anyone know what was safe to eat and how to avoid the more dangerous predators? Well, fear no longer. Dinosaur expert, Dougal Dixon has prepared a survival guide for use for anyone who wants to travel into the Jurassic period. By reading A Survival Guide: Living with Dinosaurs in the Jurassic Period, you will become acquainted with the latest research on the plants and animals of the Jurassic period and learn which ones may be of use and which ones best avoided Dixon gives advice on finding the perfect place to locate your prehistoric getaway and how to best make use of the natural resources of the period. It’s kind of a quirky idea, but honestly, I cannot think of a better way to learn about the dinosaurs of the Jurassic period. A Survival Guide is a lot more fun to read than a book on prehistoric life written in a more regular format. I have to confess that the first chapters, in which Dougal Dixon gives a rather exhaustive survey of the geography of the Jurassic period, are a little slow going, but once he gets into the descriptions of the life forms, the book’s pace picks up. There is one curious omission, though. I find it hard to imagine that human beings could survive in a world with creatures as large as the Apatosaurus or the Allosaurus without firearms, of maybe even something heavier. Yet, Dixon nowhere mentions guns. I don’t think I would care to have to fight off one of the great theropods armed with nothing more than a spear or an axe and I am not at all sure that a fence of sharpened sticks would be sufficient to ward off migrating sauropods. At the very least, I think it might be useful to learn where their weak spots might be and whether the armor of an ankylosaur is bulletproof. 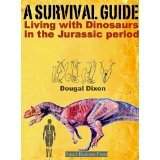 A Survival Guide by Dougal Dixon is a fun and informative book to read, whether you are a dinosaur novice wanting to learn more, or an expert.